Not to be confused with Province of Rome. The Roman provinces (Latin: provincia, pl. provinciae) were the lands and people outside of Rome itself that were controlled by the Republic and later the Empire. Each province was ruled by a Roman who was appointed as governor. Although different in many ways, they were similar to the states in Australia or the United States, the regions in the United kingdom or New Zealand, or the prefectures in Japan. Canada refers to some of its territory as provinces. A province was the basic and, until the tetrarchy (from 293 AD), the largest territorial and administrative unit of the empire's territorial possessions outside Italy. The word province in Modern English has its origins in the Latin term used by the Romans. Provinces were generally governed by politicians of senatorial rank, usually former consuls or former praetors. A later exception was the province of Egypt, incorporated by Augustus after the death of Cleopatra; it was ruled by a governor of only equestrian rank, perhaps as a discouragement to senatorial ambition. This exception was unique, but not contrary to Roman law, as Egypt was considered Augustus' personal property, following the tradition of the kings of the earlier Hellenistic period. The Latin term provincia also had a more general meaning of "jurisdiction". The Latin word provincia originally meant any task or set of responsibilities assigned by the Roman Senate to an individual who held imperium (right of command), which was often a military command within a specified theater of operations. Under the Roman Republic, the magistrates were elected to office for a period of one year, and those serving outside the city of Rome, such as consuls acting as generals on a military campaign, were assigned a particular provincia, the scope of authority within which they exercised their command. The territory of a people who were defeated in war might be brought under various forms of treaty, in some cases entailing complete subjection (deditio). The formal annexation of a territory created a province, in the modern sense of an administrative unit that is geographically defined. Republican-period provinces were administered in one-year terms by the consuls and praetors who had held office the previous year and who were invested with imperium. Rome started expanding beyond Italy during the First Punic War. The first permanent provinces to be annexed were Sicilia in 241 BC and Corsica et Sardinia in 237 BC. Militarized expansionism kept increasing the number of these administrative provinces, until there were no longer enough qualified individuals to fill the posts, and good people . The terms of provincial governors often had to be extended for multiple years (prorogatio), and on occasion the senate awarded imperium even to private citizens (privati), most notably Pompey the Great. Prorogation undermined the republican constitutional principle of annual elected magistracies, and the amassing of disproportionate wealth and military power by a few men through their provincial commands was a major factor in the transition from a republic to imperial autocracy. 147 BC – Macedonia in mainland Greece. It was annexed after a rebellion by the Achaean League. 120 BC – Gallia Narbonensis (southern France); prior to its annexation it was called Gallia Transalpina (Gallia on the other side of the Alps) to distinguish it from Gallia Cisalpina (Gaul on this same side of the Alps, in northern Italy). It was annexed following attacks on the allied Greek city of Massalia (Marseille). 67 BC – Creta et Cyrenae; Cyrenaica was bequeathed to Rome in 78 BC. However, it was not organised as a province. It was incorporated into the province of Creta et Cyrenae when Crete was annexed in 67 BC. 63 BC – Pontus et Bithynia; the Kingdom of Bithynia (in North-western Anatolia – Turkey) was bequeathed to Rome by its last king, Nicomedes IV in 74 BC. It was organised as a Roman province at the end of the Third Mithridatic War (73–63 BC) by Pompey, who incorporated the eastern part of the defeated Kingdom of Pontus into it in 63 BC. 58 BC – Cilicia et Cyprus; Cilicia was created as a province in the sense of area of military command in 102 BC in a campaign against piracy. The Romans controlled only a small area. In 74 BC Lycia and Pamphylia (to the east) were added to the small Roman possessions in Cilicia. Cilicia came fully under Roman control towards the end of the Third Mithridatic War – 73–63 BC. The province was reorganised by Pompey in 63 BC. Cyprus was annexed and added to this province in 58 BC. 46 BC – Africa Nova (eastern Numidia – Algeria), Julius Caesar annexed eastern Numidia and the new province called Africa Nova (new Africa) to distinguish it from the older province of Africa, which become known as Africa Vetus (old Africa). Gallia Cisalpina (in northern Italy) was a province in the sense of an area of military command, but was never a province in the sense of an administrative unit. During Rome's expansion in the Italian peninsula, the Romans assigned some areas as provinces in the sense of areas of military command assigned to consuls and praetors (not proconsuls or propraetors as in the case of administrative provinces) due to risks of rebellions or invasions. This was applied to Liguria because there was a series of rebellions, Bruttium and to (Calabria) because of perceived risks of rebellion. In the early days of the Roman presence in Gallia Cisalpina, the issue was rebellion. Later, the issue was risk of invasions by warlike peoples east of Italy. The city of Aquileia was founded to protect northern Italy from invasions. Gaius Julius Caesar granted the inhabitants of this region Roman citizenship and incorporated the region into Italy. In the so-called Augustan Settlement of 27 BC which established the Roman Empire, the governance of the provinces was regulated. Gaius Julius Caesar Octavianus, having emerged from the Roman civil wars as the undisputed victor and master of the Roman state, officially laid down his powers, and in theory restored the authority of the Roman Senate. Octavian himself assumed the title "Augustus" and was given to govern, in addition to Egypt, the strategically important provinces of Gaul, Hispania and Syria (including Cilicia and Cyprus). Under Augustus, Roman provinces were classified as either public or imperial, meaning that their governors were appointed by either the senate or by the emperor. Generally, the older provinces that existed under the republic were public. Public provinces were, as before under the republic, governed by a proconsul, who was chosen by lot among the ranks of senators who were ex-consuls or ex-praetors, depending on the province assigned. The major imperial provinces were under a legatus Augusti pro praetore, also a senator of consular or praetorian rank. Egypt and some smaller provinces where no legions were based were ruled by a procurator (praefectus in Egypt), whom the emperor selected from non-senators of equestrian rank. The status of a province could change from time to time. In AD 68, of a total 36 provinces, 11 were public and 25 imperial. Of the latter, 15 were under legati and 10 under procuratores or praefecti. During the principate, the number and size of provinces also changed, either through conquest or through the division of existing provinces. The larger or more heavily garrisoned provinces (for example Syria and Moesia) were subdivided into smaller provinces to prevent any single governor from holding too much power. 30 BC – Aegyptus, taken over by Augustus after his defeat of Mark Antony and Cleopatra VII of Egypt in 30 BC. It was the first imperial province in that it was Augustus' own domain as the Egyptians recognised him as their new pharaoh. Its proper initial name was Alexandrea et Aegyptus. It was governed by Augustus' praefectus, Alexandreae et Aegypti. 27 BC – Hispania Tarraconensis; former Hispania Citerior (northern, central and eastern Spain), created with the reorganisation of the provinces in Hispania by Augustus (imperial proconsular province). 27 BC – Hispania Baetica; former Hispania Ulterior (southern Spain); created with the reorganisation of the provinces in Hispania by Augustus (senatorial propraetorial province). The name derives from Betis, the Latin name for the Guadalquivir River. 27 BC – Illyricum, Augustus conquered Illyria and southern Pannonia in 35–33 BC. Created as a senatorial province in 27 BC. Northern Pannonia was conquered during the Pannonian War (14–10 BC). Subdivided into Dalmatia (a new name for Illyria) and Pannonia, which were officially called Upper and Lower Illyricum respectively in 9 BC, towards the end of the Batonian War. Initially a senatorial province, it became an imperial propraetorial province in 11 BC, during the Pannonian War. It was dissolved and the new provinces of Dalmatia and Pannonia were created during the reign of Vespasian (69–79). In 107 Pannonia was divided into Pannonia Superior and Pannonia Inferior – imperial provinces (proconsular and propraetorial respectively). 6 AD? – Moesia (on the east and south bank of the River Danube part of modern Serbia, the north part of North Macedonia, northern Bulgaria), Conquered in 28 BC, originally it was a military district under the province of Macedonia. The first mention of a provincial governor was for 6 AD, at the beginning of the Batonian War. In 85 Moesia was divided into Moesia Superior and Moesia Inferior (imperial proconsular provinces). 6 AD – Judaea, imperial procuratorial province (reverted to status of client kingdom in 41 AD and became province again in 44 AD; renamed Syria Palaestina by Hadrian in 135 AD and upgraded to proconsular province). 17 AD – Cappadocia (central Anatolia – Turkey); imperial propraetorial (later proconsular) province. 42 AD – Mauretania Tingitana (northern Morocco); after the death of Ptolemy, the last king of Mauretania, in 40 AD, his kingdom was annexed. It was begun by Caligula and was completed by Claudius with the defeat of the rebels. In 42 AD, Claudius divided it into two provinces (imperial procuratorial province). 42 AD – Mauretania Caesariensis, (western and central Algeria), after the death of Ptolemy, the last king of Mauretania, in 40 AD, his kingdom was annexed. It was begun by Caligula and was completed by Claudius with the defeat of the rebels. In 42 AD Claudius divided it into two provinces( imperial procuratorial province). 41/53 AD – Noricum (central Austria, north-eastern Slovenia and part of Bavaria), it was incorporated into the empire in 16 BC. It was called a province, but it remained a client kingdom under the control of an imperial procurator. It was turned into a proper province during the reign of Claudius (41–54) (imperial propraetorial province). 43 AD – Britannia; Claudius initiated the invasion of Britannia. Up to 60 AD, the Romans controlled the area south a line from the River Humber to the Severn Estuary. Wales was finally subdued in 78. In 78–84 Agricola conquered the north of England and Scotland. Scotland was then abandoned (imperial proconsular province). In 197 Septimius Severus divided Britannia into Britannia Superior and Britannia Inferior. Imperial provinces (proconsular and propraetorial respectively). 43 AD – Lycia annexed by Claudius (in 74 AD merged with Pamphylia to form Lycia et Pamphylia). 46 AD – Thracia (Thrace, north-eastern Greece, south-eastern Bulgaria and European Turkey), it was annexed by Claudius (imperial procuratorial province). 47 AD? – Alpes Atrectianae et Poeninae (between Italy and Switzerland), Augustus subdued its inhabitants, the Salassi, in 15 BC. It was incorporated into Raetia. The date of the creation of the province is uncertain. It is usually set at the date of Claudius' foundation of Forum Claudii Vallensium (Martigny), which became its capital (imperial procuratorial province). 63 AD – Alpes Cottiae (between France and Italy), in 14 BC it became a nominal prefecture which was run by the ruling dynasty of the Cotii. It was named after the king, Marcus Julius Cottius. It became a province in 63 (imperial procuratorial province). 72 AD – Commagene, its client king was deposed and Commagene was annexed to Syria. 74 AD – Lycia et Pamphylia. Vespasian (reigned AD 69–79) merged Lycia, annexed by Claudius, and Pamphylia which had been a part of the province of Galatia. 83/84 AD – Germania Superior (southern Germany) The push into southern Germany up to the Agri Decumates by Domitian created the necessity to create this province, which had been a military district in Gallia Belgica when it was restricted to the west bank of the River Rhine (imperial proconsular province). 83/84 AD – Germania Inferior (Netherlands south of the River Rhine, part of Belgium, and part of Germany west of the Rhine) originally a military district under Gallia Belgica, created when Germania Superior was created (imperial proconsular province). 107 AD – Dacia "Trajana" (the Romanian regions of south-eastern Transylvania, the Banat, and Oltenia), conquered by Trajan in the Dacian Wars (imperial proconsular province). Divided into Dacia Superior and Dacia Inferior in 158 by Antoninus Pius. Divided into three provinces (Tres Daciae) in 166 by Marcus Aurelius: Porolissensis, Apulensis and Malvensis (imperial procuratorial provinces). Abandoned by Aurelian in 271. 103/114 AD Epirus Nova (in western Greece and southern Albania), Epirus was originally under the province of Macedonia. It was placed under Achaia in 27 BC except for its northernmost part, which remained part of Macedonia. It became a separate province under Trajan, sometime between 103 and 114 AD and was renamed Epirus Nova (New Epirus) (imperial procuratorial province). 116 AD – Mesopotamia (Iraq) seized from the Parthians and annexed by Trajan, who invaded the Parthian Empire in late 115. Given back to the Parthians by Hadrian in 118. In 198 Septimius Severus conquered a small area in the north and named it Mesopotamia. It was attacked twice by the Persians (imperial praefectorial province). 116 AD – Assyria, Trajan suppressed a revolt by Assyrians in Mesopotamia and created the province. Hadrian relinquished it in 118. 193 AD – Numidia, was separated from Africa Proconsularis by Septimius Severus (imperial propraetorial province). 194 AD – Syria Coele and Syria Phoenice, Septimius Severus divided Syria into these two units in the north and the south respectively. Imperial provinces (proconsular and propraetorial respectively). 214 AD – Osrhoene, this kingdom (in northern Mesopotamia, in parts of today's Iraq, Syria and Turkey) was annexed. 271 AD – Dacia Aureliana (most of Bulgaria and Serbia) created by Aurelian in the territory of the former Moesia Superior after his evacuation of Dacia Trajana beyond the River Danube. Many of the above provinces were under Roman military control or under the rule of Roman clients for a long time before being officially constituted as civil provinces. Only the date of the official formation of the province is marked above, not the date of conquest. Emperor Diocletian introduced a radical reform known as the tetrarchy (284–305), with a western and an eastern Augustus or senior emperor, each seconded by a junior emperor (and designated successor) styled caesar, and each of these four defending and administering a quarter of the empire. In the 290s, Diocletian divided the empire anew into almost a hundred provinces, including Italy. Their governors were hierarchically ranked, from the proconsuls of Africa Proconsularis and Asia through those governed by consulares and correctores to the praesides. These last were the only ones recruited from the equestrian class. The provinces in turn were grouped into (originally twelve) dioceses, headed usually by a vicarius, who oversaw their affairs. Only the proconsuls and the urban prefect of Rome (and later Constantinople) were exempt from this, and were directly subordinated to the tetrarchs. Although the Caesars were soon eliminated from the picture, the four administrative resorts were restored in 318 by Emperor Constantine I, in the form of praetorian prefectures, whose holders generally rotated frequently, as in the usual magistracies but without a colleague. Constantine also created a new capital, known after him as Constantinople, which was sometimes called 'New Rome' because it became the permanent seat of the government. In Italy itself, Rome had not been the imperial residence for some time and 286 Diocletian formally moved the seat of government to Mediolanum (modern Milan), while taking up residence himself in Nicomedia. During the 4th century, the administrative structure was modified several times, including repeated experiments with Eastern-Western co-emperors. Provinces and dioceses were split to form new ones, the praetorian prefecture of Illyricum was abolished and reformed. In the end, with the rise of Odoacer in 476 and the death of Julius Nepos in 480, administration of the effectively reduced Empire was permanently unified in Constantinople. Detailed information on the arrangements during this period is contained in the Notitia Dignitatum (Record of Offices), a document dating from the early 5th century. Most data is drawn from this authentic imperial source, as the names of the areas governed and titles of the governors are given there. There are however debates about the source of some data recorded in the Notitia, and it seems clear that some of its own sources are earlier than others. It is interesting to compare this with the list of military territories under the duces, in charge of border garrisons on so-called limites, and the higher ranking Comites rei militaris, with more mobile forces, and the later, even higher magistri militum. Justinian I made the next great changes in 534–536 by abolishing, in some provinces, the strict separation of civil and military authority that Diocletian had established. This process was continued on a larger scale with the creation of extraordinary Exarchates in the 580s and culminated with the adoption of the military theme system in the 640s, which replaced the older administrative arrangements entirely. Some scholars use the reorganization of the empire into themata in this period as one of the demarcations between the Dominate and the Byzantine (or the Later Roman) period. As a matter of scholarly convenience, the medieval phase of the Roman Empire is today conventionally referred to as Byzantine, named after the original name of the city that Constantine rebuilt into the new capital of Constantinople. ^ Richardson, John (2011). "Fines provinciae". Frontiers in the Roman World. Proceedings of the Ninth Workshop of the International Network Impact of Empire (Durhan, 16–19 April 2009). Brill. p. 2ff. ^ "The Administration of the Empire". The Cambridge Ancient History. Cambridge University Press. 9: 564–565, 580. 1994. ^ Ando, Clifford (2010). "The Administration of the Provinces". A Companion to the Roman Empire. Blackwell Publishers. p. 179. ^ Lintott, Andrew (1999). The Constitution of the Roman Republic. Oxford University Press. p. 113ff. ^ Brennan, T. Corey (2000). The Praetorship in the Roman Republic. Oxford University Press. p. 626–627. ^ Lintott, Andrew. The Constitution of the Roman Republic. p. 114. ^ Brennan, T. Corey. The Praetorship in the Roman Republic. p. 636. ^ Nicolet, Claude (1991) . 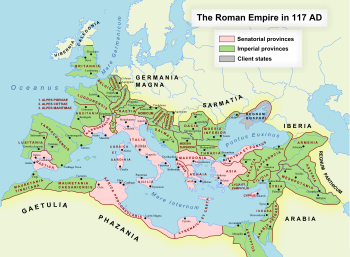 Space, Geography, and Politics in the Early Roman Empire. University of Michigan Press. p. 1, 15. ^ Hekster, Olivier; Kaizer, Ted. Frontiers in the Roman World. p. 8. ^ Eder, W. (1993). "The Augustan Principate as Binding Link". Between Republic and Empire. University of California Press. p. 98. Lintott, Andrew (1993). Imperium Romanum. London: Routledge. Mommsen, Theodor (1909). The Provinces of the Roman Empire. 2 vols. London: Ares Publishers. Scarre, Chris (1995). 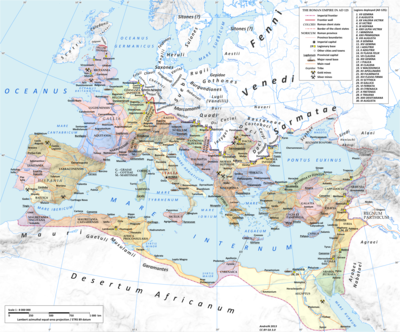 "The Eastern Provinces," The Penguin Historical Atlas of Ancient Rome. London: Penguin Books, 74–75. Loewenstein, Karl (1973). The Governance of Rome. Springer. ISBN 90-247-1458-3. Wikimedia Commons has media related to Roman provinces.